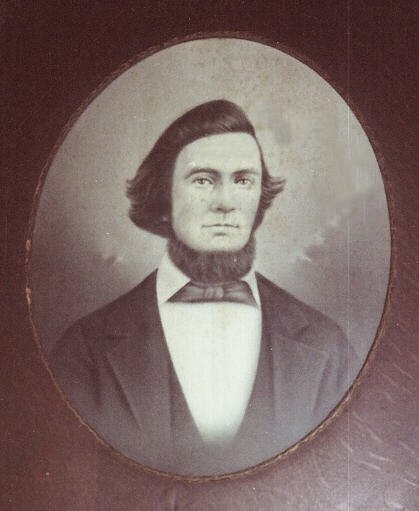 This portrait of my great-great-grandfather Joseph Morris Hunter hung in the living room of the Hunter home at 906 Magnolia Ave., Charlotte, N.C. for many years. According to Hunter Demos, it is a composite, with Joseph’s head superimposed on a shirt, tie, and coat that have been painted in. At age 40, Joseph was too old to be drafted into the Confederate Army, so he volunteered. He joined the Fourth South Carolina Cavalry, using his own horse. He was killed on May 30, 1864, probably during a skirmish at Matadequin Creek, near Cold Harbor, VA, in the early stages of the battle of Cold Harbor. Joseph enlisted in the 4th Cav at Green Pond, SC on ----- 1862. After spending nearly two years in South Carolina, his unit was joined with the Army of Northern Virginia, under Gen Robert E. Lee. Joseph fought in the campaign of North Virginia (May 1864). This page is still under construction - more to come. Buried at Holy Rood Cemetery, Blenheim, S.C. The Bible was her guide. 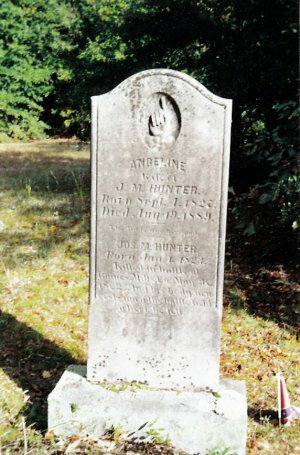 and to G. Hunter for the photo of Angeline's tomb and the inscription text.